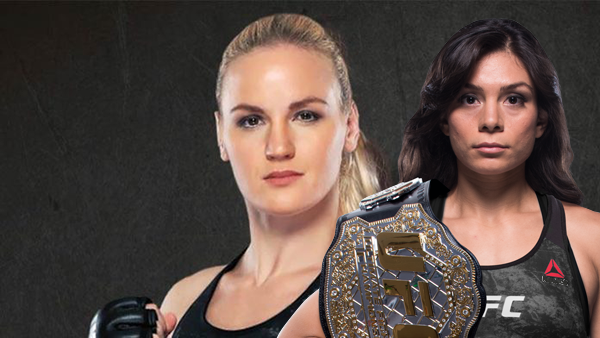 Valentina Shevchenko to Nicco Montano: "If you don't wanna fight, leave the belt"
UFC women’s flyweight contender Valentina Shevchenko has been clambering for a shot at Nicco Montano’s 125-pound title in her next bout, and amid previous rumors suggesting she signed on to meet the champion at UFC Calgary on July 28, nothing has been made as of yet. The champion went on Instagram to report to her fans that she was in the process of recovering from a Tonsillectomy and as soon as she was back in shape, she’d be ready to take on Shevchenko. “Bullet” on the other hand says she hasn’t heard anything from the UFC in terms of a date or time when a UFC women’s flyweight title fight will be made, and even went as far as to demand that Montano exit the title scene altogether if she isn’t willing to defend her belt when speaking on ‘The MMA Hour’ on Monday. “Not yet, we are not at that point [Montano vacating the title],” Shevchenko told Ariel Helwani on the latest episode of The MMA Hour, “but I think it would be very right to do things like this because if you are not ready to fight, if you don’t want to fight, you have to leave the belt — you cannot hold it. Despite hearing the news of the women’s UFC flyweight champion’s health conditions, she claims Montono hadn’t even accepted to fight her on July 28th before hand, but knows she’ll be making a summer return. “First Nicco said she was ready for July 7 and the they came back to her with July 28, but she said no. I don’t know what she’s thinking. Maybe she thinks she has done everything she wanted to in her life and she’s ready to go and retire — I don’t know. “I understand that she will be ready some time at the end of the summer. I will be here waiting to fight for the title. She just can’t run all the time, you have to stop sometimes. I just do my job. I never stop training so I’m always in good shape. I just have to wait my time and see how it turns out,” she said. After processing all the things Montano’s been saying as far as her being ready to compete, Shevchenko is starting to come to the conclusion that the champion may be dodging her. “Yes, I feel a bit like she is [avoiding me], but I also think it could be her strategy. I don’t know if they have approached her for a date at the end of the summer, if not maybe she will accept it, but nobody can be sure if she will be fighting by then. Maybe at the very last second she could say that she still has some kind of injury and she cannot fight. Maybe it will happen, so I will continue to do my job and keep training,” Shevchenko said. What evaluation do you make of this whole situation? Will Nicco Montano ever defend her UFC women’s flyweight title? Is she in fact avoiding the dangerous striker? Next ESPN and ESPN+ to become EXCLUSIVE Media Home of the UFC in U.S.